Beginning in 1930, in the throes of the Great Depression, the U.S. government “repatriated” more than one million Mexicans and Mexican Americans. Sixty percent of them were U.S. citizens—children born in the United States to one or both parents who were Mexican nationals, spouses of Mexican nationals, and people whose papers were not available at the time they were detained and dropped on the other side of the border. For these people—and others who, like today’s Dreamers, had come to the United States as young children—Mexico was an unknown country. Many did not speak Spanish or have family members in Mexico who could take them in. The arrival of a million refugees strained Mexico’s capacity to take care of them, as that country suffered as well from the Depression and churches were quickly overwhelmed. Guadalupe García McCall’s sequel to her award-winning Shame the Stars (Tu Books / Lee & Low, 2016) takes place one generation later, when Joaquin and Dulceña are parents of 15-year-old Estrella and toddler Luis, known as Wicho. Their large ranch, Las Moras, has been in the family for generations, but Estrella’s less privileged schoolmates are disappearing one by one. After she and her remaining friends in the town’s segregated school are arrested for demonstrating against discrimination and deportation—and she and her father speak up at a town council meeting—unknown persons set her family’s house on fire and kidnap them. Estrella, her mother, and Wicho are driven across Texas to the border crossing in El Paso; they have no idea where Joaquin has been taken. They spend a week in a crowded corral in the rain and cold, deprived of food and medicine, before shipped by train to Mexico City, where they must begin a new life, find Joaquin and other missing family members (including Dulceña’s parents, the publishers of a newspaper), and try to make their way back home as Wicho’s health deteriorates. All the Stars Denied is a gripping adventure story of a family confronting catastrophe and ruin. At the beginning, Estrella is the spoiled daughter of a wealthy family, complaining about having to help take care of her equally overindulged brother. Like her parents, she believes her wealth—the extended family owns a large amount of land, as well as a newspaper and a bookstore, and employs a dozen farm workers and domestic servants—will insulate her from the spreading racism and violence. Yet the family’s wealth only means there’s more for those in power to take from them. McCall shows that at the root of racism lies the effort by those in power to take what others have, whether it be jobs, money, or property. Estrella and her family are helpless before the power of the white-controlled State; all they can do is survive in conditions in which they thought they would never have to live. As the current administration separates families at the border and threatens to strip permanent residencies and birthright citizenships at will—confiscating homes and property in the process—it’s important for readers to understand that the United States has committed similar atrocities in the past. By choosing a seemingly privileged protagonist, McCall shows that no one is safe, and an attack on one group is an attack on all of us. For more information about this little-known chapter of history, read Decade of Betrayal: Mexican Repatriation in the 1930s by Francisco E. Balderrama and Raymond Rodríguez. Rodríguez, who died in 2013 at the age of 87, lost his father in the repatriation. 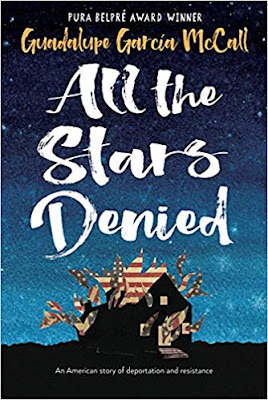 Because of its strong pacing and McCall’s thoughtful, brave, and necessary portrayal of the repatriation, All the Stars Denied is highly recommended.